SynChem, Inc. is proud to announce today that it raises $1.1 million capital from an investment group to setup its cGMP laboratory in Elk Grove Village, Illinois. "This capital investment extends our current business to the upstream of much more lucrative business arena and allows us to use SynChem as business platform to continue to build our excellent business service to our customers in pharmaceutical and biotechnology companies. We at SynChem really appreciate the great financial help from the investor group headed by Henlin-biotech, LLC for our new laboratory upgrade in this extremely challenge financial environment, and we also strongly believe this will generate great return for our investors." Said Dr. W. Paul Mar, CEO of SynChem, " Again, like the investment we commit in Y2009, this investment renews our commitment to our customers that we will continue offer the highest quality services to drug discovery, biotech and pharmaceutical industries. It also renews our commitment to society that we will continue our presence in the U.S. with our effective combined business model that has served our customers well in last 14 years." "We were pleased to assist SynChem in the setup of its GMP facility. It will not only extend its current business model but also greatly benefit Henlin-biotech’s current business model. Their research and discovery is important to our technology upgrade and modernization." said Mr. Bingye Zhang, President of Henlin-biotech in New Jersey. SynChem Appoint Dr. Ze-qi Xu to as its Chief Scientific Officer Today. SynChem, Inc., a CRO for drug research and development services, announced today a key leadership appointment supporting the expansion of its drug discovery, research and development service capabilities. Ze-qi Xu, Ph.D., has joined SynChem, Inc. as its Chief Scientific Officer. With this appointment, SynChem seeks to further expand its services and leading scientific expertise to its customers. Ze-Qi Xu, Ph.D., joins SynChem as Chief Scientific Officer. He has overall responsibility for GMP services, medicinal chemistry research, including research biology and chemistry initiatives. He will report to the Company's Chief Executive Officer. Dr. Xu brings to SynChem more than 20 years' experience in the design, discovery and development of novel therapeutics, including an extensive background in infectious diseases. He has joined SynChem after holding increasingly senior roles at several companies, including a 9-year tenure at Advance Life Science, where he departed as Chief Scientific Officer, overseeing GMP pharmaceutical manufacturing, IND and NDA preparations and regulatory submissions with completion of two global phase III clinical trials and several phase I and II clinical trials in antibacterial, antiviral, anticancer, inflammation and respiratory disease therapies. API manufacturing of the antibacterial ketolide has passed FDA pre-approval inspection. Other past positions include Vice President of Strategic Drug Discovery and Development at MediChem Life Sciences and Adjunct Research Associate at Argonne National Laboratories. Dr. Xu is an inventor on 19 patents and has co-authored 59 peer-reviewed publications. He is a regular presenter at scientific conferences. Dr. Xu received his B.S., M.S. and Ph.D. degrees, respectively, from Jiangxi Normal University, Shanghai Medical University and Shanghai Institute of Organic Chemistry. "We are very pleased to welcome ZQ to SynChem, and we appreciate the tremendous amount of experience he brings from biotechnology companies in bridging research and development," said W. Paul Mar, SynChem's Chief Executive Officer. "At a time when we are poised for significant advancement across multiple programs, I am confident ZQ's background and leadership will prove invaluable to SynChem as we continue to build our medicinal chemistry-center service model." Mr. Zhuohe Zhou, Chairman of Wuxi Fortune Pharmaceuticals and Guangdong Aimin Pharmaceuticals, visited SynChem, Inc.
Today SynChem welcome Mr. Zhuohe Zhou, Chairman of Wuxi Fortune Pharmaceuticals and Guangdong Aimin Pharmaceuticals, and Mr. Kevin Huang, Chairman and President of Truecolor Group. Mr. Zhou and Mr. Huang discussed with Drs. W. Paul Mar, Daniel Fang and ZQ Xu about the future collaboration between SynChem and Wuxi Fortune in the field of new antibiotics drug discovery and new generic drug new technology development. 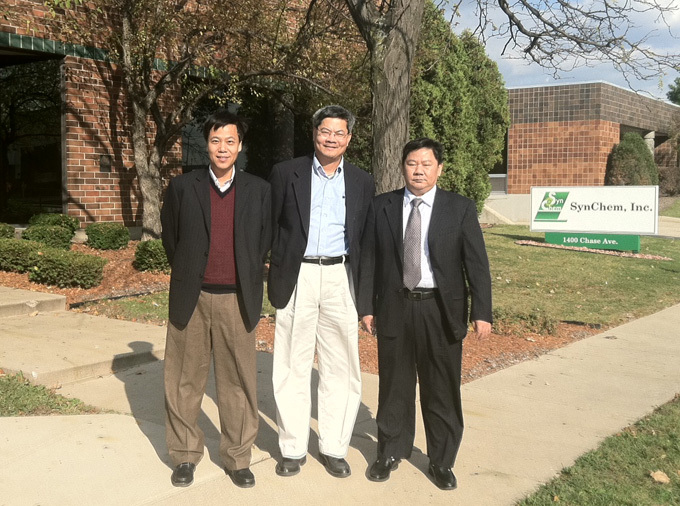 "We are very pleased to have the guesses like Mr. Zhou and Mr. Huang to visit SynChem Chicago headquarters to discuss the huge opportunities that presents currently in the Chinese pharmaceutical industry and we certainly are sure we can team up with Wuxi Fortunate to join in this technology upgrade grand trends in China." said W. Paul Mar, SynChem's Chief Executive Officer. "The research capabilities and business reputation SynChem has built up since 1997 is exactly the collaboration target Wuxi is looking for in the past years and SynChem current business model will greatly benefit to both of us, especially to our technology upgrade and modernization." Said Mr. Zhou of Wuxi Fortunate Pharmaceuticals.